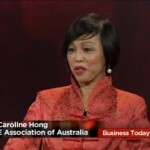 Dr Caroline Hong appears on ABC-TV BUSINESS TODAY program. Here she chats with the award winning highly respected Whitney Fitzsimmons on critical challenges facing Small and Medium Enterprises in Australia. She speaks candidly on the sensitive and difficult issue about the Asian Century, Foreign Investments, Trade missions and opportunities for SMEs. This interview was broadcast to 44 countries on 27 September 2013 in Australia, China, and most of Asia. 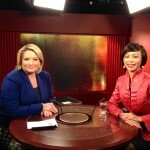 I was interviewed recently by the award winning Whitney Fitzsimmons for the ABC -TV BUSINESS TODAY program. It was a rare opportunity where Whitney asked me on my views on a number of issues that I am passionate about, and which I have been advocating for some time. I spoke from a perspective that reflects what an Asian Australian businesswoman and company director feel very strongly about the Australian Asian Century. We often hear views and panel discussions from experts at key business forums where the SME perspectives are often not given sufficient recognition. 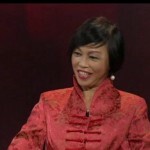 Australia is rich with talented people who have deep Asian experience and understanding. Many are from Asian origins and have lived and worked in Australia for a long time. Many have also been actively engaging with Asia for trade and investments. I am pleased to share some of my thoughts on a wide range of issues in this interview shown on the ABC – TV BUSINESS TODAY program on Friday 27 September 2013. What are the critical challenges facing small and medium enterprises ? What should the new Coalition government be offering? What sort of changes are you expecting to see with the Federal government? What are the other main challenges facing small and medium enterprises? Sino -Australia ties – What sort of policies would you like to see happening, to strengthen Australian business doing business in the region? Trade Missions? What are your views on the proposed tightening of Foreign investment in Australia? Thank you to ABC for reaching out to me to share with you my perspective, as the representative from the SME Association of Australia. Note: The ABC –TV BUSINESS TODAY program is broadcast on ABC-1 and News24 Monday – Friday, as well as twice daily throughout the region to 44 countries in the Asia-Pacific via the Australia Network, the ABC’s international channel. The regional broadcast footprint includes China, Indonesia etc. BUSINESS TODAY is presented by the highly respected and award-winning journalist, Ms Whitney Fitzsimmons.